The preface included statements praising the book and explaining how it had come to be printed. Sometimes a book also ended with one or more afterwords that said similar things. These prefaces and afterwords could be written by the author, the person who paid for the book’s publication, or their friends and employers. Therefore, the prefaces to medical texts are useful to historians because they reveal what kinds of medical techniques and practitioners that people thought were useful and effective. Sometimes one copy of a book would be printed repeatedly, with each publisher adding new prefaces. Thus, prefaces can indicate where and how frequently a particular text was printed, which allows us to know what types of books were in demand and how they were circulated.When Wen Huide published this book in 1830, he chose not to write a new preface. 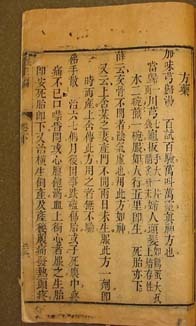 The preface in this edition was written in 1826 by a scholar named Hao Wensi, who was making his living as a teacher. 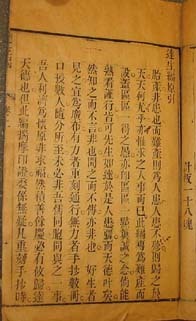 Hao’s preface states that the book was originally printed by his employer, Mr. Ji Huanzhang, who wanted to make useful knowledge widely available. 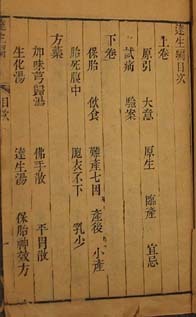 Wen Huide probably obtained a copy of Ji’s text and only reprinted it with a new title page.This edition also includes the original preface written by Jizhai. Normally, the original author’s preface would be placed at the front of the text, but here the editors have placed it into the body of the text. Jizhai’s preface says that his book contains all the essential knowledge that people need to prevent difficult childbirth, and anyone who reads it should make copies and distribute it as widely as possible. Because books usually consisted of one or more chapters, a table of contents was provided for the reader’s convenience, which listed the topics covered in each chapter. This edition of Treatise on Successful Childbirth contains two chapters. The first discusses how to ensure safe labor and delivery, and the second discusses how to preserve the health of the mother and child during pregnancy. The last part of the second chapter also provides recipes for several medical remedies that people could administer to the woman during pregnancy or labor. Finally, the publisher appended information on how to take care of the newborn and prevent smallpox infection. Here the author provides additional information on why he has written the book and explains why he has chosen to organize it in a particular way. 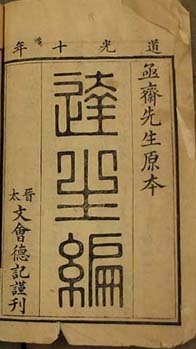 Jizhai tells his readers that this is a household manual that men and women ought to read together during pregnancy so that they will be able to manage the birth correctly. He also explains that he placed the section on childbirth at the beginning so people could immediately find the important information, even if they were in a state of panic. Here the author would describe his ideas and provide recipes for medical remedies. The order of topics varied according to the genre of book. In works on women’s diseases, the first section was usually about menstrual disorders, followed by management of pregnancy and childbirth, and then the treatment of postpartum diseases (illnesses that occur as a result of childbirth or in the period immediately after childbirth). Jizhai’s book is unusual because it talks primarily about childbirth, not menstruation, and relatively little about pregnancy and postpartum. People who republished popular medical works texts frequently attached material of their own at the end of the book. This usually included descriptions of additional remedies that the person had found to be effective. Jizhai told his readers to reprint his text, but he asked them not to supplement the information because it needed no amelioration. 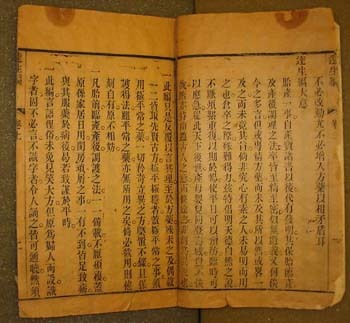 Nevertheless, when people reprinted Treatise on Successful Childbirth, they frequently added medical recipes and childbirth charms, as well as personal testimonials.People who reprinted Jizhai’s text did not always write a new preface or a new title page, but they would frequently place their names somewhere in the appendices. These appendices can provide additional information on how often the work was being reprinted, how people were using it, and what kinds of other remedies that people were actually using.